Thankfully, we caught Wouter, the bone expert, right before he took off for vacation. Also, I highly recommend visiting Wouter’s website, especially if you wish to take a bird skull quiz that will demoralize yet enthrall you. I scored a 928 out of 1200, which I deem respectable since I don’t know anything about these European jobbies like “hawfinches” and “bullfinches.” You will be pleased to know, Seanetters, that I knew the Gannet right away. 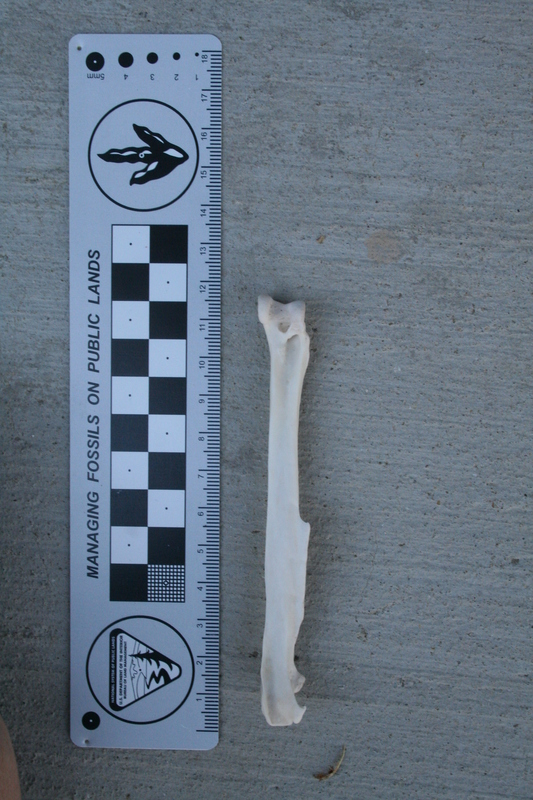 broken ulna bone (lower arm) of a bird, 2 x humerus (upper arm) of a bird, an a vertebra of which I cannot say much, 2 x radius bone (lower arm) of a mammal, and a tibia bone (lower leg) of a bird. 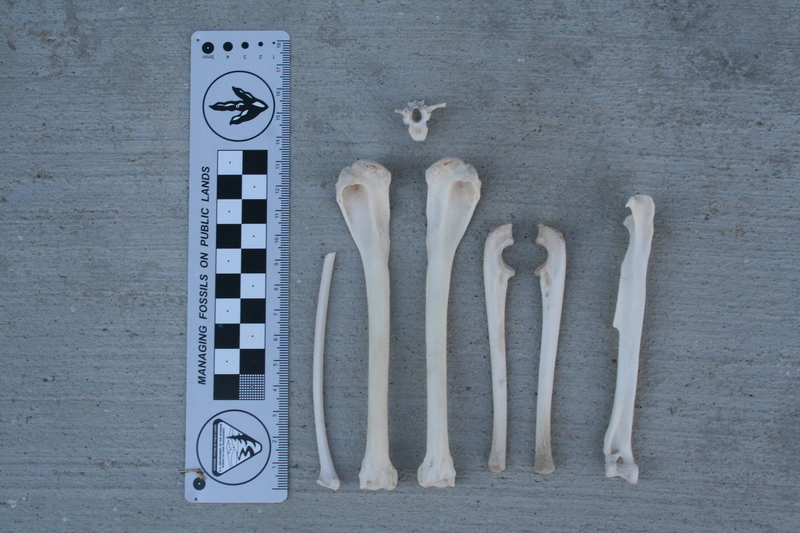 I am not generally so good at this as Wouter, but I did pick out the bird humeri and knew that the two bones with the c-shaped groove at the top were mammalian. But there, I do differ from Wouter. Those bones with the c-shapes look very like mammalian ulnas (ulnae?) to me. The ulna and radius are the bones of the forearm, and they meet the humerus (upper arm bone) at the elbow. 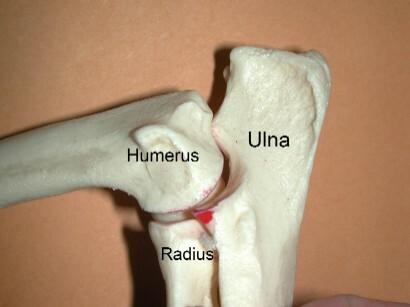 In mammals, the ulna has a deep, half moon shaped groove to accommodate the trochlea of the humerus. 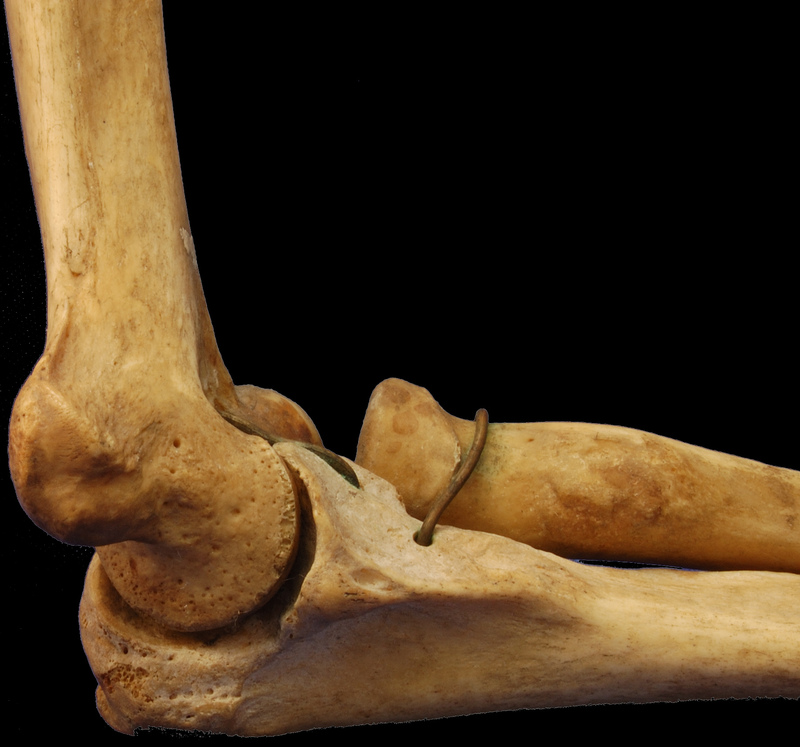 The ulna can thus slide over the humerus as the elbow is bent and straightened. The ulna (bottom bone) cups the trochlea of the humerus (bone running vertically). The radius, in back, has a flat head. Dog elbow. Note how squared off the top of the ulna (the olecranon process) is. By contrast, the radius, which sits right next to the ulna, has basically a flat top that wedges up next to the humerus.The thing about these bones that I think are ulnae is that they lack the prominent olecranon process at the top with which I am familiar from my vet school anatomy days. Dog ulnae have a big, squarish olecranon jutting up above the c-shaped groove. Not all mammals have that feature; cats, for instance, have a more sloping olecranon. Weasels, and raccoons, kind of in the middle. In short, I do not know whose ulnae these might be, but I do feel confident that they are ulnae, and mammalian. Then again, I did only get a 928 on the skull quiz. All this talk about mammal bones has made me, if not nostalgic for, then at least susceptible to the memory of my first year of vet school, when each student was loaned a bone box–a disarticulated dog skeleton in a tackle box. (They were plastic model bones, much to my great disappointment). 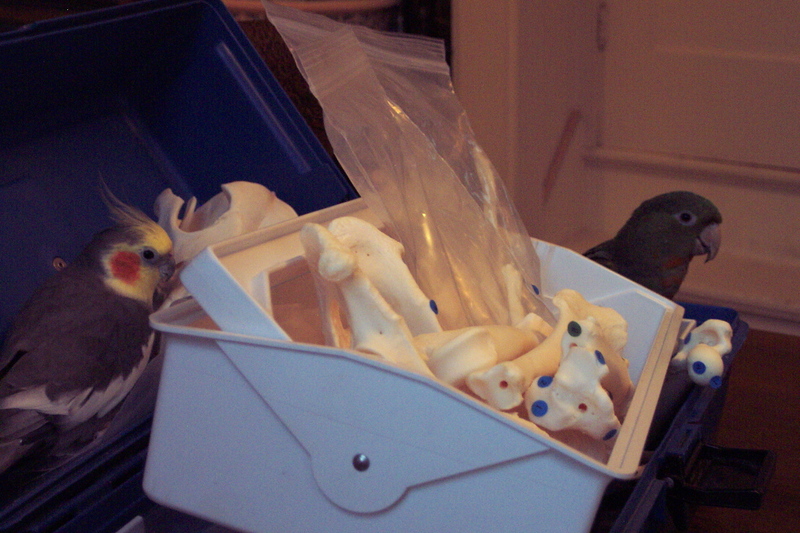 I would study at home with my bone box and my pet birds out and about on the table. If you ever wondered about the relative supremacy of birds versus mammals, I need say nothing beyond what this picture can tell you. Birds in the bone box. By now, most of my feces and regurgitate besmirched clothes are washed and drying on the line, and I have had a few moments to think about the events of the past week. 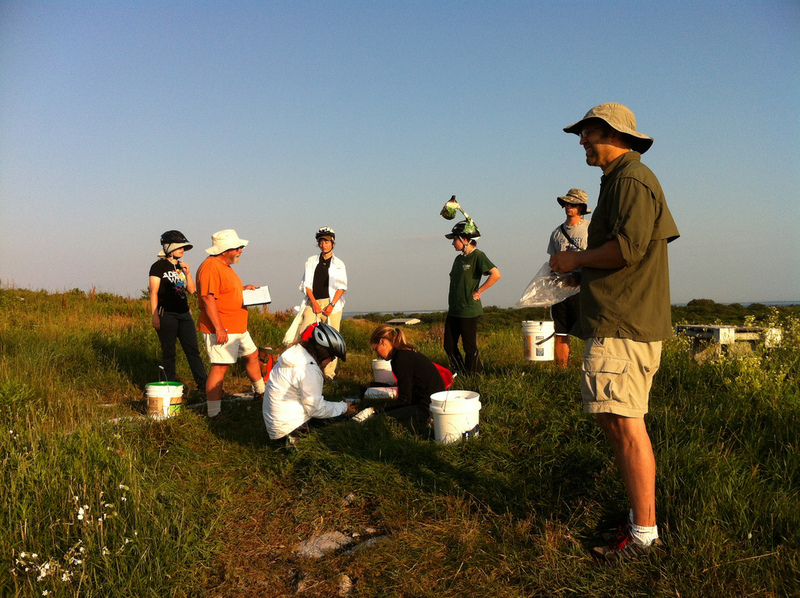 I was out on Appledore Island banding gull chicks, and taking blood and oral and cloacal swabs. Oh! The glamour! My knees ache from seven days of crouching or kneeling on granite slabs, and there’s a small bit of blood spatter that may not ever come off of my field pants. A small souvenir to remember the birds by. None of that middle paragraph is wrong; it is chaotic, and it is feces stained, and the birds do attack with substantial force when their chicks are menaced. 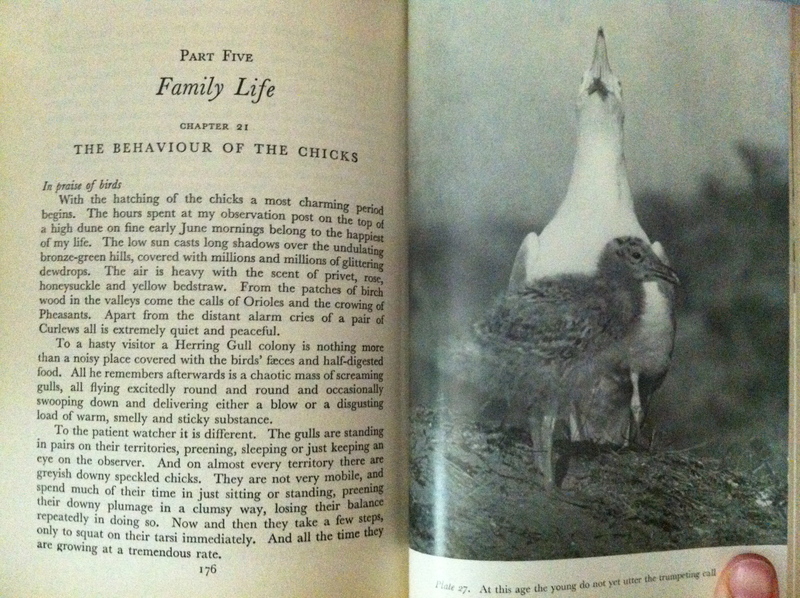 But what Tinbergen and all of us gullers know is how enthralling the colony is too. This year, we put together a great team of gull catchers, banders, bleeders and swabbers. They came from Virginia, Florida, New York, Pennsylvania, Massachusetts and New Hampshire. Two of them were students at North Shore Community College where I teach biology and animal science. One of them, Nick Lovasco, wrote a truly lovely letter of thanks to the benefactors and mentors who afforded him the opportunity. You can read his letter here. For Nick, and for just about everyone else who comes out to Appledore to work with the gulls, their perspective is permanently altered. Nearly all begin making plans to come out the following year before we’re even finished with this year’s work. I catch them gazing out at the ocean, or watching a gull chick peep incessantly at its sleeping parent. They want their pictures taken with the birds; they want leg bands to take home as souvenirs. One student, when allowed to take a blood sample herself, choked back amazed tears after succeeding. An early morning in the field for the gull team. More than the science we do, this is what keeps me going back again and again: watching students’ eyes open, literally and figuratively, to the natural machinery all around them, and, for my students at least, to the ecology of their own coastal backyard. This is highly unorthodox, but I got a plea for help with an i.d. on some bleached bones found by Evan Boucher out on the…Pacific coast! I know, I know. Wrong ocean. But I’m a sucker for dead things. Not much to go on, but it may be enough. Evan reports that the bones were all in the same general vicinity, but he acknowledges that they may not, in fact, be from a single individual or even a single species. Up for a challenge? Give this one a try. And you’ll have plenty of time to ponder since I’ll be on vacation all week. Now get to work! A closer look at one of them. Seabird spotters needed to cruise Stellwagen Bank! This week, I am racing around Appledore Island in Maine banding gulls and taking blood from them for an avian influenza survey, but I have a truly excellent opportunity to advertise to my more northern readership. New Englanders, take note of this! 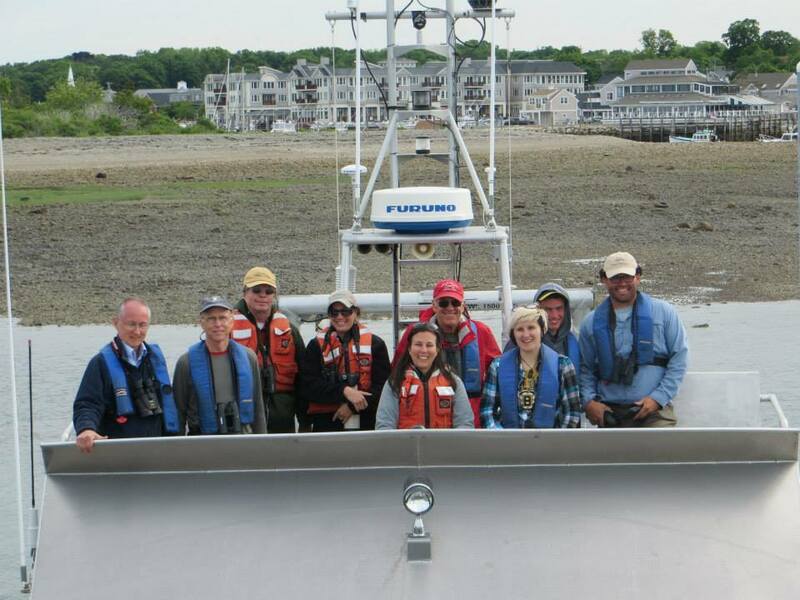 An S4 citizen scientist crew on a seabird cruise in June. You could join too! Stellwagen Bank National Marine Sanctuary and its partner, Mass Audubon, are looking to better understand the dynamics, roles and importance of seabirds within the ecosystem. We wish to establish a baseline for seabird populations within the sanctuary boundaries, educate the public about the important role that seabirds play within the ecological community and to train volunteers to conduct citizen science on behalf of the Stellwagen Sanctuary Seabird Stewards (S4) Program. The S4 Program is in its sophomore year and has been supported largely by volunteers that participate either aboard our research vessel or on whale watching trips. During these trainings, we will go over the protocol followed for these research cruises and provide you with an overview of what the S4 Program is all about. People with excellent seabird identification abilities and field research experience are encouraged to attend! 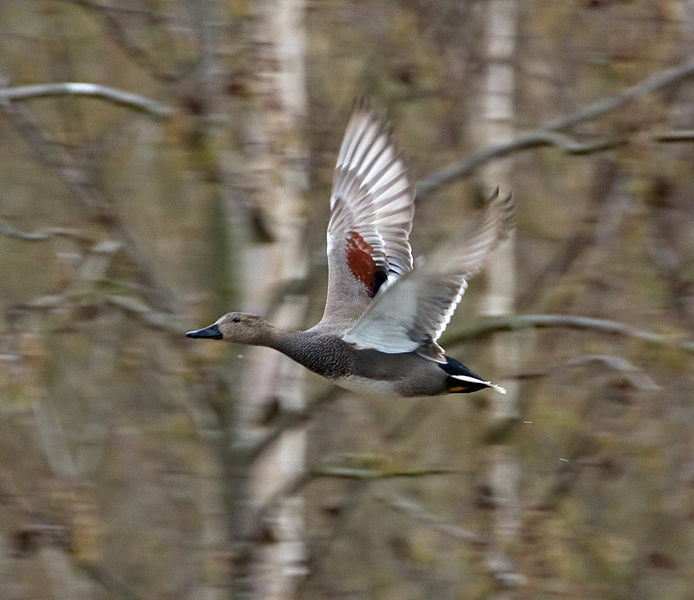 Adult male Gadwall showing flashy chestnut wing patch. Horrifying. 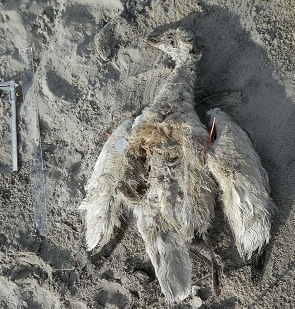 I’ll stick with dead seabirds and nothing more complicated than the molts of eiders, thank you very much. 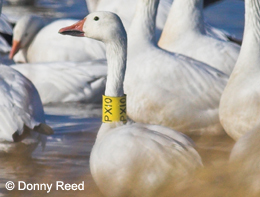 Wintering, staging, and breeding grounds of the Greater Snow Goose. Now for Bird B, also pre-identified by the finder, Wendy Stanton, as a Snow Goose. I have never seen a Snow Goose either, but fortunately, everyone agreed on this one as well, and John Stanton even narrowed it down to Greater Snow Goose, which I then had to go look up. The Snow Goose page in Sibley also caused me to shudder in confusion. There is apparently a dark morph, which was once thought to be a separate species (the “Blue Goose”) and a white morph, which looks similar to the Ross’s Goose, only with a bigger bill and faint reddish tinge to the head. In ghastly waterfowl fashion, there are also Snow Goose x Ross’s Goose hybrids, but apparently it’s mostly the Lesser Snow Goose that engages in such cross-species dalliances. So what about this Greater Snow Goose John mentioned? Apparently, it is defined by a longer, stockier bill and head than the Lesser, which is, in turn, more wedge-headed than the adorably round-headed and small billed Ross’s Goose. it’s the cheater’s way to know it’s a Greater Snow Goose, and also, you should report it to the research team. 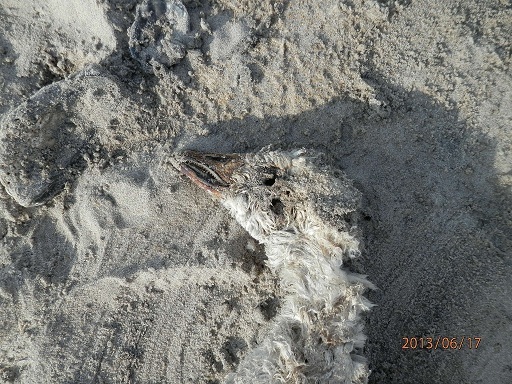 After my last post apparently sent several readers into a tailspin of depression and despair, I decided it was time for something cheery, like dead birds on a beach. 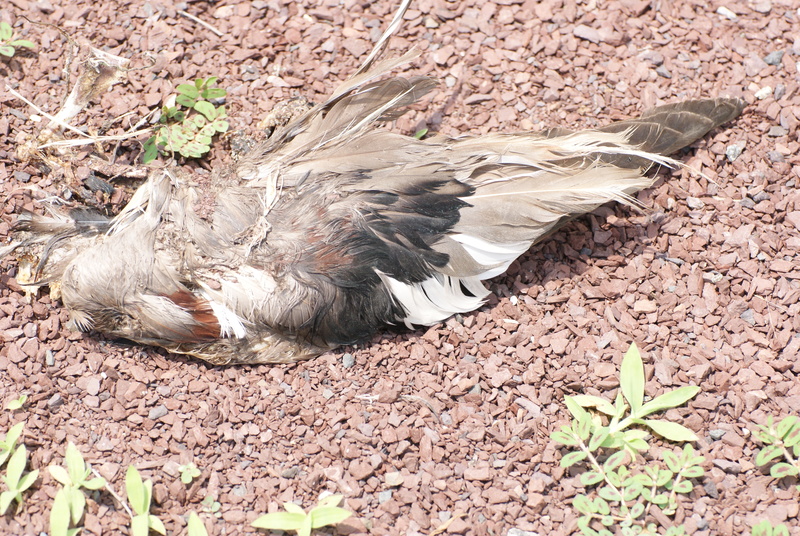 Bird A: Found by Jerry Golub in NJ last month. Bird B: Found by Wendy Stanton in NC last month.